In various interviews this week, and after meeting with Israeli officials, McCain sharply criticizes Obama administration's policies. Republican Senator John McCain on Thursday sharply criticized the Obama administration’s policy in the Middle East. “We lost influence, we lost power. We are seen as helpless,” McCain said in an interview with the Arabic language Al-Hurra TV. He specifically criticized US Secretary of State John Kerry, saying he was disappointed with the way Kerry has dealt with countries like Syria, Iran, Iraq and Afghanistan, as well as the Israeli-Arab conflict. Earlier Thursday, McCain fired at US Secretary of State John Kerry's policies in the Middle East at a public forum for The Atlantic. "Frankly, I have never been more worried about the parameters of this deal," he stated, according to the Washington Free Beacon. "I'm told yesterday that Secretary Kerry refused to give any details of the United States' position in these negotiations - yet at the same time, [he] wants to rely on our good will [. . .] this guy has been a human wrecking ball." McCain also noted, "I talk to Middle-Eastern countries all the time. This is the first time that I've seen Israel and Arab countries united concerning Iran." 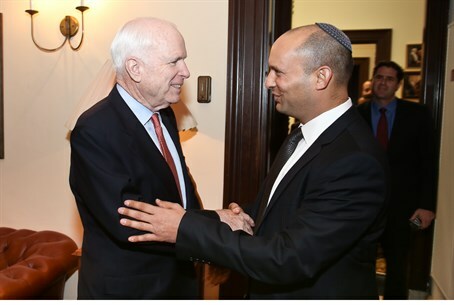 This week, the Senator also met with Economics Minister Naftali Bennet, who is on a special mission to lobby the US Congress to continue economic sanctions on Iran - a position McCain enthusiastically supports. Kerry has tried to prevent the mission's success, reportedly directing US Senators to "stop listening to the Israelis" in order to prevent a lobby for more sanctions. The remarks also follow statements by U.S. President Barack Obama, who on Thursday issued a direct warning to Congress against further sanctions on Iran, saying that a deal in the works could prevent the "unintended consequences" of war. "If we're serious about pursuing diplomacy, there's no need for us to add new sanctions on top of the sanctions that are already very effective and that brought them to the table in the first place," Obama said.